Everyone loves lists, so why not include a couple of lists for our end of summer blogging sessions? I’m going to focus on lists for the kitchen and bathroom this month, so watch for them! Let me know what you think or other lists you would like to see by commenting in the comments section or sending me an email. Let’s get started on the bathrooms list now. Here are bathroom design trends that were popular among homeowners in 2014. Homeowners enjoy being able to make changes to their decor without worrying about clashing colors. Most homeowners who built or remodeled a bathroom in 2014 did so using neutral colors and natural materials. Stone and stone tiles were very popular among those building upper-range bathrooms this year. Many environmentally-conscientious homeowners seek to use sustainable products or those created using recycled materials. Regardless of the materials used, neutral colors were in high demand. Different shades of gray, bone, and beige were very popular this year due to their ability to look amazing with any decor from brilliant reds to deep blues, greens, or nearly any other color you wish to use. Homeowners enjoy the luxury of being able to sit and relax in the shower. Longer showers or baths have been proven to reduce the stress introduced in everyday life. Shower seating allows you to be comfortable while letting the water wash away the troubles of the day. Many people who look toward the future, and aging in place options, also request larger showers with shower seating. The steam room at the gym is an incredible spot to sit, relax, and detoxify your body. Homeowners are simply moving that experience to the comfort of their own bathroom by installing steam showers. How many times have you stumped your toe on the metal railing for the glass shower door, or almost tripped stepping out of the shower-tub combo? Eliminate those risks by installing a seamless shower threshold. This is usually achieved by installing a shower area with a 3/4 wall without a wall or curtain. The door area is simply left open. Water issues are taken care of by inclining the flooring very slightly so water drains to the drain area and not into the rest of the bathroom. 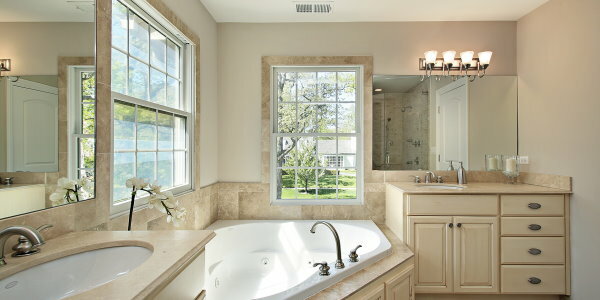 Bathtubs were often removed and replaced with showers in the early-to-mid 2000s, but now people are requesting that the large garden tub or soaking tub be reintroduced into their homes. People are becoming more health conscious and prefer a nice relaxing hot bath to a rushed shower. A long bath, especially one with additives such as mineral salts, reduces stress and promotes sleep. People are often confused by the mention of universal bathroom design so I’ll take a moment to explain. Universal design is simply designing for now and for later. Redesigning a new shower, for example, may include the placement of grab bars in case of accidental falls. This is a good idea for any age, but especially as you get older. Many Americans are living independently in their homes well into their 80s and 90s. Our older citizens deserve all of the special amenities we can provide. They are, after all, the reason we’re all here. Heated flooring is becoming very popular. No one wants to get up in the middle of the night to freeze their toes while taking a quick bathroom break mid-slumber. Radiant flooring is usually accompanied by a steam shower and a soaking tub because it is much more comfortable to step out of a steam room or a nice hot bath and onto a warm floor. Comfort height toilets, vanities, and baths are emerging as must-haves. Remodeled bathrooms of 2014 usually include shower benches, and oval-shaped toilets as well, instead of round toilet seats. Many homeowners have also included the bidet into their bathroom design to increase the functionality of their bathroom. I hope you’ve enjoyed the Sundance Homes, LLC. end of summer list. I have a difficult time believing it’s already August, but I do look forward to seeing what fall and winter bring along the lines of new trends in our area. Remember, let me know what you think about these trends and ideas by commenting or emailing me. I’d be glad to blog about your ideas as well!